Welcome to Giza Month! This month, I’m going to fill you in on the creation of one of the Seven Wonders of the World: the Pyramids at Giza, and their surrounding, but lesser known, treasures. Finally, we’ll end the month with a discussion of the ongoing and heated debate surrounding the construction of the pyramids. It’s evident that Giza Month should begin with the largest and most iconic pyramid in the history of Ancient Egypt: The Great Pyramid constructed during the reign of Pharaoh Khufu (known in some ancient documents by the Greek version of his name, Cheops). Built over an estimated 20-30 year period, Khufu’s pyramid stands around 480 feet tall, with a base length of more than 750 feet per side. Almost more impressive than the pyramid’s imposing dimensions is the fact that the difference in length among the four sides is a mere 4.4 cm, an incredible engineering accomplishment for an ancient society. The Great Pyramid of Giza incorporates around 2.3 million stone blocks weighing an average of 2.5 to 15 tons each. The stones you see in the image above are the inner, locally quarried core stones. During the original construction, angled outer casing stone made of white Tura limestone was installed on top of these less ornamental blocks to give the pyramid a smooth surface while being bright and reflective. Finally, the pyramid would have possessed a capstone, known as a pyramidion, that may have been gilt, and would have certainly been visible for miles around. 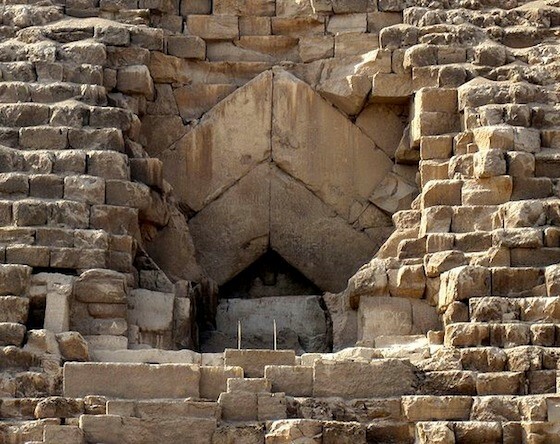 Both the pyramidion and casing stones were removed and repurposed long ago in order to construct other monuments. 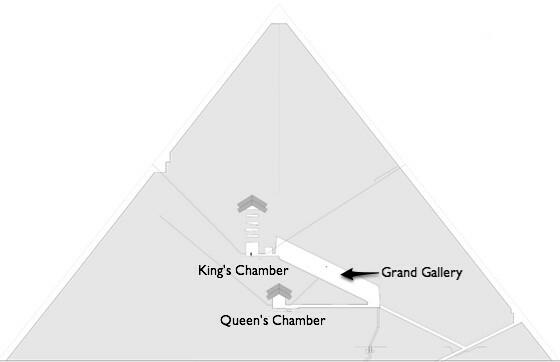 To enter the pyramid, the visitor has to crawl up an extremely cramped ascending chamber that opens suddenly into the Grand Gallery. From this 26-foot tall corbelled passageway, the visitor can decide to descend to the Queens Chamber or the unfinished subterranean chamber below, or to ascend to the King’s chamber, which is constructed entirely from red granite brought from the southern quarries at Aswan. Above the King’s Chamber are five stress-relieving chambers of granite blocks that create a roof that helps distribute the weight of the pyramid itself. The king’s sarcophagus was found sitting at the exact central axis of the pyramid in a burial chamber. The chamber was sealed with a collection of large granite blocks and the entrance of the main shaft filled with limestone to obscure the opening to the human eye. 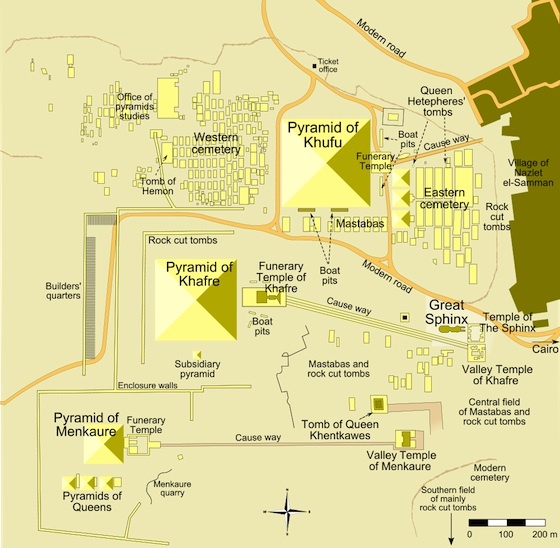 The pyramid was not Khufu’s only successful construction project: The Great Pyramid was the centerpiece of an entire complex, which includes several smaller pyramids, a mortuary temple, a causeway, a valley temple, many small tombs for officials and some members of the royal family, and more than five large boat pits. 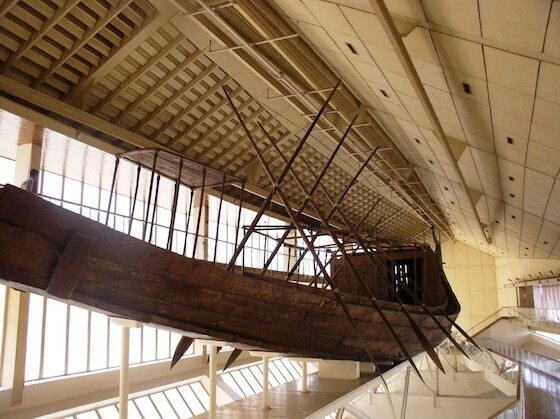 These boat pits, which have a history of accompanying pharaonic mortuary structures (discovered at the Dynasty 1 pharaonic cemetery at Abydos), were intended to store the boats the pharaoh would need to transport himself across the sky in the afterlife. Although five of these pits contained only boat-shaped models, two pits on the south side of the Great Pyramid contained completed disassembled boats and all the supplies necessary to build them. Using only ancient instructions and materials (or materials created through use of ancient instructions), one of these boats was removed and reconstructed, now standing in a special museum on the south side of the pyramid. The reconstructed cedar boat is 142 feet in length and contains 1,224 individual pieces! Investigation of the burial site, seems to indicate that these boats were most likely used for the funerary procession of the pharaoh to his resting places, and were then dismantled and buried. 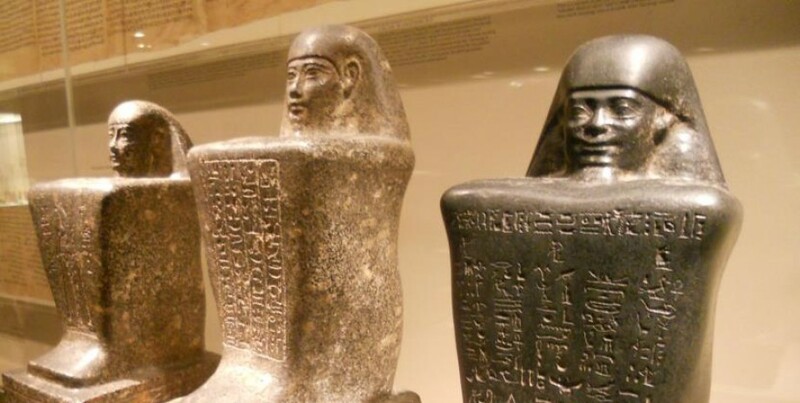 Khufu’s Great Pyramid and the accompanying treasures not only helped to insure the safe passage of the king into the afterlife, but have contributed to humankind’s continuing fascination with Ancient Egypt. 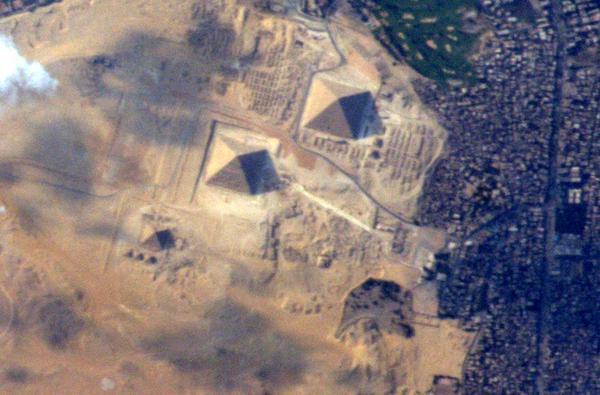 People from all over the world continue to flock to Giza to see these monuments. Even in an age dominated by technology and somewhat jaded human sensibilities, the pyramids represent something grand and immovable, they exert a mysterious power, drawing our attention and stirring our imagination. Mark Lehner, The Complete Pyramids (Thames and Hudson, 2008). David O’Connor, Abydos: Egypt’s First Pharaohs and the Cult of Osiris (Thames and Hudson, 2011).